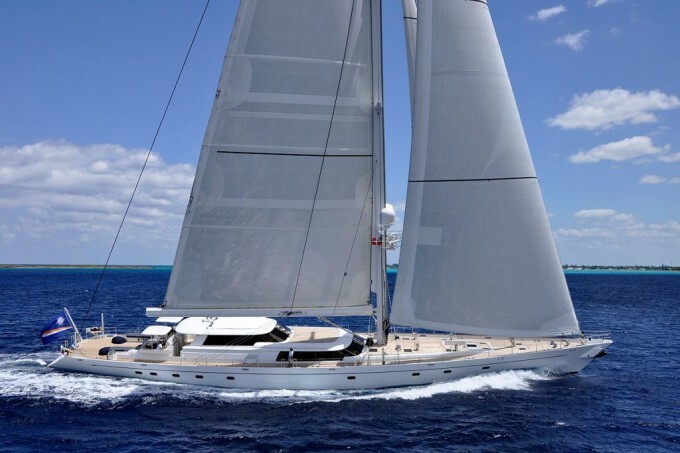 Charter Sailing Yacht HYPERION for St Barth Bucket in the Caribbean – Superyachts News, Luxury Yachts, Charter & Yachts for Sale. One of the best known sailing yachts, HYPERION is currently available to compete in the popular St Barths Bucket in the Caribbean. Built in 1998 by the renowned shipyard Royal Huisman, HYPERION recently underwent a substantial 9-month refit, where she received a new paint job of the hull and superstructure, new teak decking, her saloon windows were replaced, one of the onboard diesel generators were removed, a new shore power converter was installed, she has received a new refrigeration system, overhaul of the HVAC system, renewal of the compile alarm-monitoring system and numerous other maintenance works have been carried out. HYPERION boasts naval architecture by German Frers, measures 47,4 metres and features beautiful traditional lines combined with the latest in technology. She can provide unforgettable charter experience for a group of six guests, accommodated in three comfortable deluxe cabins. Accommodation is situated below deck and includes one queen-bed, one king-bed and one twin cabin with single beds. Interior of this outstanding vessel was penned up by Pieter Beeldsnijder and is represented by warm mahogany panels with inlaid marquetry, beautiful Moroccan marbles, fine custom-made fittings and spacious, luxurious and comfortable interior areas. There are three lounge areas: the pilot house has two vast seating possibilities with tables, and offers fabulous views. The upper deck boasts plenty of windows, a formal dining area and another area for relaxation and socialising. Lowe saloon is perfect for evening entertainment, also offering plenty of space to unwind, including occasional chairs and even a piano. The yacht provides spacious exterior living with the aft deck providing a covered seating area, dual helm stations alfresco dining option and plenty of possibilities to entertain. A removable Bimini cover adds additional comfort, regardless of the weather or occasion. HYPERION has a substantial beam of 9.5m (31.4ft). Her wrap around wide decks provide comfortable access to the vast, flush foredeck and ample relaxing areas. HYPERION is fitted with a carbon fibre mast, which stands at 59m (193.5ft) in length and exerts some 200 compressive tons at the base. She has 59 km of wiring and 13,000 square feet of sail area. Unique indoor amenities include a state of the art temperature controlled wine rack for some 200 bottles and over 500 billion bytes of computer technology. Royal Huisman received a prestigious Showboats International Award for the best sailing yacht over 38 metres (125ft), while the yacht and crew were the winners of the Super Yacht Millennium Cup Yacht Race in New Zealand. There is a great selection of water toys aboard this fabulous vessel as well as an extended hydraulic swim platform. Those who are after a more active vacation will find making use of the water toys effortless, while others may wish to simply soak up the warm Caribbean sun.